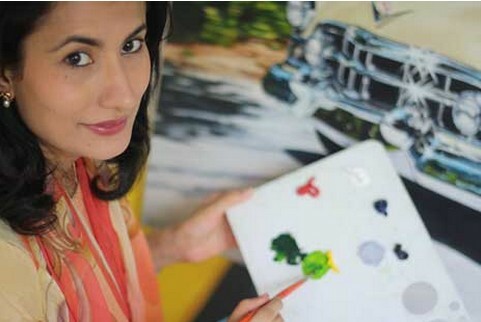 Princess Vidita Singh is a leading automotive artist in India. Born into the royal family of Barwani, she was surround by Vintage and Classic cars during her childhood. Vidita, you have a rich history in the automotive world. Can you share that with me? It has been passed down for generations and from my great grandfather onwards. It is an honour to continue the legacy. My great grandfather was the Maharaja for the state of Barwani in Central India and was one of the first people to get the steam locomotive into Central India and encourage the building of roads. So that's how it all began. So your family has played an important role in developing the automotive industry. Yes, my grandfather imported many cars into India. It is actually my father (His Highness Manvendra Singh) and my uncles who have been striving to preserve the Indian automotive history. My father is the leading automotive historian in India. He has written a book 'The Automobiles of The Maharajas'. Largely due to their influence, I started out by helping my Dad to document the history of these automobiles and it took off from there. Did you help him to write that book? I helped with the research, the photographs and to make them come alive through my art. That is my contribution to the book. Your childhood memories must have a relationship with these old classic cars. Yes, as a baby, I remember sitting in classic and vintage cars. Usually there were a lot of American cars from the 50's, Cadillac's and Lincolns etc. I understand that your education was in art history. 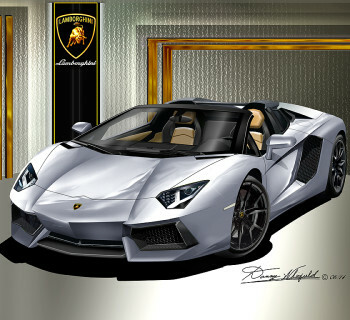 Why did you choose automotive art? I have always been fond of art and only started painting seriously from the age of 17. At school I did my Bachelors on the history of India because I wanted to be informed. I also have a Masters degree in the history of art. I absorbed myself in the various arts in India and the world, to understand the differences. This helped me and added to improve my art. My father commissioned me to illustrate one of his articles which was a Fiat Corsa. After that, I decided to become an automotive artist. Studying art and studying art history, is different from making art yourself. Did that always go hand in hand with you? Studying different artists and the way they work and the different mediums they work with, helped me develop my own work. Your artwork shows your pride of your country and the history of India. I started out documenting historical aspects of Indian motor history. I wanted to bring out the beauty of the country and the cars as they would have been in their hay day. So that was my basic idea. To put cars in an Indian background, where they would have been parked in palaces, driving up a dusty road, up a mountain or going up the Indian Himalayas. That is how it started out but then I diversified into doing very exotic cars especially designed for the Maharaja's. I am melting history with art. Your artwork of the Minerva at Mehmoodabad Palace has a lot of detail on the architecture. Do you study old photo's to get it right? That is correct. For that painting, I got photo's of the palace and then I put the car into proportion. It was commissioned by the person who owns that car and he wanted the car in front of the palace. So I did this composition for him. Is there a specific style in India related to painting? There are artists who paint realistic art but most Indian artists are into the modern trend. They are using imaginative ideas for depicting nature of Gods etc. You did the 'Rolls-Royce Boat tail framed in a Mughal border'. Is that a traditional way of presenting artwork? Mughal paintings used to be framed in a floral boarder. I picked it up from there and put my idea of mixing history and other artwork with automobile art. You seem to be playing with a new style of Art Deco. There is less detail in those paintings. What is it about that style which is so appealing to you? I am very fond of painting that era and style. I do that more in water colours than in oils. But I guess it just depends upon my mood and the car and what suits the car. Then I decide upon the style I use. Looking at your Art Deco work, it seems to show more of your own personality. Does it feel that way to you? Yes, I am not restrained to bring out realistic backgrounds and I play with the different lines and textures. So you think it reflects more of my personality? I hadn't seen it like that before but everyone interprets art in their own way. It's the lines and colours of the cars. I don't always know beforehand what the end result will be. It happens while I am painting and I just keep adding elements to it. You use different materials such as oils, charcoal, watercolours etc. Do you have a favourite or a specific material for a certain kind of artwork? The chrome and metal come out the best in oils. I can get better and more realistic results in oils than I do in watercolours. I feel that my strong point is oil painting. You also have photographs on your website. Do you paint from a photo? Yes I paint from photographs to get the proportions right and also because it's too hot in India to paint outside. If I have a commission, I usually work from black and white photos. I paint the car into different backgrounds which I feel would be appropriate for that era, unless I am commissioned to do a particular background. Yes because then I can see and feel the personality of the owners and the cars. I usually go to take photographs for my paintings which then come out with more feeling. Do you sketch while you are there? No because I like to sketch when I am alone in my studio, where I can concentrate to the fullest. What is the automotive scene like in India today. Is there are large group of car enthusiasts? It is now becoming very popular to collect classic cars in India as well. At every show you see the level of enthusiasm. Restoration has vastly improved since eight or ten years ago. 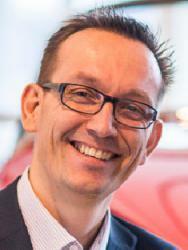 The automotive culture has really come to the forefront and it's growing. Yes and he was one of the judges there as well. Does India have enough cars from the past or are they imported. India has a lot of cars left over from the past. In the 50's they banned car export from India. You could not sell your old vintage car abroad because it was Indian heritage and had to stay in India. No it's not been an easy ride. 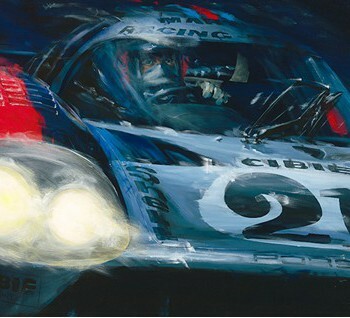 In general, people mainly do not classify automotive art as 'Art'. Only the people who are interested in cars. But I do see a change in the last four to five years which has been encouraging. I have also been diversifying my art to what I call, wearable art. You studied history, so you have seen all the regular art. What is your vision on why automotive art is generally not accepted as 'Art'. If a painting is beautiful, it is a piece of art. People take still life, like a bowl of fruit, paint it and call it art. If you put a car in the painting, it would be still life too. But in the period when still life was very popular, they didn't have cars at that time. If people can equate a bowl of fruit to art, why is the same not done with automotive art? Putting so many interesting lines of engineering and design into one object and making beautiful realistic art which people enjoy is 'Art'. What needs to be done to convince the regular art world to pay more attention to automotive art? I think it needs to be explained. They are not able to categorize it. I think that is the problem. They view it more as engineering and not as art. Vincent van Gogh made a statement by cutting off his ear. Do you think we need to make a grand statement or is it just too premature? 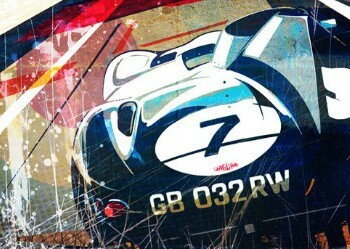 Do we need a couple of decades more to start appreciating Automotive Art? I guess so. Nowadays they are making electric cars and maybe in years to come, they will be seen as classic. It's generic and is becoming more suited to the economy and space. Modern designs don't appeal to me and there are few sports cars which I find beautiful. They don't inspire me to paint them because they miss the beauty and the lines and design. I still like the design of the classic vintage car. Do you have an example of a recent car which you might find appealing enough to paint? I am always so involved in painting classic cars but my brother is an automotive journalist and he shows me modern cars. I would say that Porsche has kept its' essence, apart from the SUV which they did and which doesn't appeal to me. The classic Porsche still has the beauty of the lines which I value in the old cars. You mentioned that you added a new creative medium into wearable auto art. How did that start? I like scarves and it's something most people like to wear. I saw my brother and father wearing pocket squares, so I thought why not. Men love cars. I started designing some for myself and some pocket squares for my father . Then I showcased my designs in an exhibition and got a pretty good response with it. I am not doing it on a large scale. Lines are not repeated. I make a batch and that's it. Maybe I will do the same design in a different colour if someone asks me, but I usually keep it to one exclusive design. Do you enjoy doing these fashion statements and your decorative elements, like the cushion covers? Yes. It's an extension of being creative. I can't sit in one place for too long and although I concentrate on whatever I am doing, I stop and go for a walk or maybe do something else. Then I come back to it again. That's the way I work. One of my decorative lines are printed suede and leather cushion covers. You use paintings as the basis, like the Rolls-Royce. Do you also use your photo work? Yes, I use a mixed style. You won't find the exact image of my paintings on these products because when I sell someone a painting, I want them to have the exclusivity. It's otherwise not fair to the person buying the painting. So the print is just part of the painting or in a different colour and then I decorate it. I want to paint every car which represents Indian history and bring out each of their beauty and character as a tribute to Indian history and the work of my family. I am still learning and experimenting with a lot of styles and I still have a lot of ideas. I just need to get the time. I have a six year old who takes a lot of my time. I feel that my style is realistic but maybe I am still looking for something which defines my art. I am trying to establish my work. The Indian media has been very kind. They find my work different from other artists and have given me coverage. I am hoping to do an exhibition later in October or November and will keep you posted.